Counting is an essential foundational skill for learning more advanced math concepts. Counting out loud with kids in everyday life can be a fun way to build math fluency and confidence. 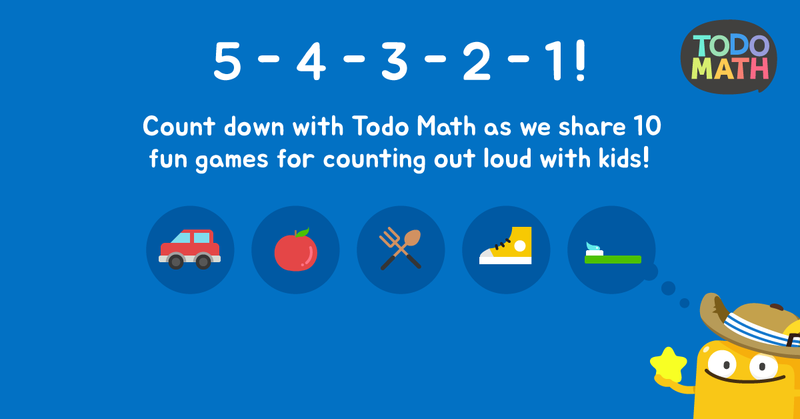 At Todo Math, we love counting with our kids! Here are ten counting games kids and parents can enjoy together. When everyone is seated, families can count together. Questions like “How many people are seated at the table?” or “How many eyes and fingers are at the table?” are great ways to start. For an added bonus, try an estimation game of guessing how many leaves of lettuce are in the salad. Be careful, this activity is not intended to start a food fight! While brushing teeth, kids can count each brush stroke, count to a time limit, or count down from a chosen number. Now, getting ready for bed can also serve the purpose of getting ready for math! Whether at home, in a hotel, or at a sporting event with bleachers, use the stairs to practice counting at loud. Count the stairs going up. Count the stairs going down. Or, skip a step and count by twos. Each step represents one more way to connect real-world objects with numbers. Do you have a favorite childhood song or nursery rhyme? Try substituting numbers into the lyrics of a favorite song. For example, skip count by 4 to the tune of Row Row Row Your Boat by singing 4-8-12-16! At any time of the day, it’s easy to start a discussion about what comes next. Have a grown-up say a string of numbers, like 0-1-2-3, and then ask what comes next. Or try the reverse and count down from 10, asking what comes next after 10-9-8-7-6. You can even mix it up by skip counting. For example, what comes next after 2-4-6-8? While driving, have a conversation about the cars on the road. “How many red cars do you see? Let’s count each one!” Mix it up with trucks, convertibles, or motorcycles to keep the subject flowing. Then, start with 10 and try counting down. For more car counting activities, check out the Tally O’Malley storybook by Stuart J. Murphy, where children tally the cars as they go. Pull out a store receipt and let the kids have a look. Ask them how much money was spent, how much change was received, and if they can find the most expensive purchase. If the conversation grows into how to save money, it’s a win for the whole family! Get fit and count at the same time. Count how many sit-ups everyone in the family can do. Who can do the most? By how many? Challenge a family member to set a new family record in sit-ups. Get outdoors and take a look around. Whether it’s clouded, butterflies, flowers or airplanes, try counting all of the different variations. How many can you count? Maybe there is something to count (like rocks) that can be collected and painted later for more family fun.